In October 2012, our clients approached Build Professional to discuss the opportunities to extend and refresh their family home in Hackett. With two younger children they found the need to expand their home with two new bedrooms that would grow with them into the future. They also requested a walk-in-robe and another bathroom to cater for the ‘morning rush’ that they knew would get more hectic as the children grew. On the exterior of the home, our clients wanted the front balcony to become a private space that was utilised more so that they could sit and enjoy the beautiful mountain views whilst dressing up the front entrance to the home. A large back entertaining deck that would integrate with the new extension was also requested. On a few occasions when Build Professional met with our clients, comments were made about the love of the trees within the backyard… especially the magnolia that was in full bloom at the time. With this in mind, the gallery walking down to the two new bedrooms was created. Two window seats were also designed to sit and read with the sun on their backs with views to the magnolia and the other much loved trees they wanted to retain. A former bedroom was remodelled into a large dressing room off the master suite and a linen cupboard was also included with access from the hallway. 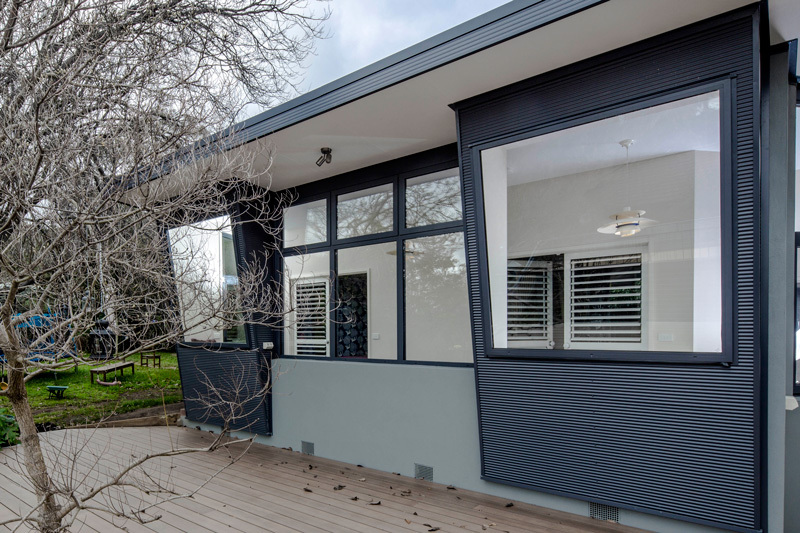 The extension was essentially a new wing for the children that included a new bathroom with separate toilet, two new bedrooms, a light filled gallery with window seats and access to the back deck and to the back yard. The design solution delighted our clients as the connection to the backyard and useability of the space was improved and it was important that the extension was light weight and sat well within its context not taking away from the backyard whilst taking in the northern sun. The large back deck adds another dimension to the home adding a beautiful sun drenched outdoor entertaining area where an existing tree sits centre stage. The client wanted an undercover area at the front door and a place that could be useable and safe for their children. The front of the home has an improved street appeal with the addition of the roofline over the front balcony by using contrasting materials. Improving the leaking balcony was high on the priority list so adding the composite decking allowed the sealing of the balcony. The handrail was designed specifically around an existing reading chair to allow for the clients to sit and enjoy the uninterrupted views yet provide privacy to their balcony and family room. A careful planning approach to construction allowed minimal head heights over windows to allow maximum northern sunlight to drench into the bedrooms via the plantation shutter doors to the hallway. We were able to maintain the use of the existing heating system by designing the roof trusses and roof beams to allow for the ducting requirements and cantilever of the roof. The outcome has resulted in a modern addition that has resolved issues of the function of the existing home, meeting the demands of a busy young family that are growing. The double plantation shutter bedroom doors, gallery and window seats are an integral part of design, allowing it to be more then ‘just a hallway’ that connects you to the bedrooms. The light that streams into the rooms, a place to sit by a window and the connection to the backyard has been resolved in creative and beautiful ways. Our clients were pleased by our considered advice and impressive execution of the plans that has resulted in a home that ‘continually delights them.’ Working with our clients has been a pleasure and it has been a privilege to work with and create beautiful spaces for a lovely young family where we are sure, memories will be made!